I just got my copy of the BT Journal. This is a fantastic journal that Moose Peterson produces. 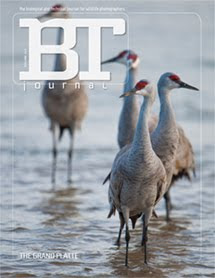 BT stands for the biological and technical journal for wildlife photographers. This issue is all about our adventures on the Platte River. This journal always contains stunning photos and great technical information - but it is the stories that really will grab you. You can order this journal from Moose on his website - moosepeterson.com. If you really want to improve your photography - this is one publication that you must have. Pick it up and tell Moose - Mark sent you. I know - it is hard to believe that Moose and I spent this time together. But I assure you that it is true. Thanks Moose for letting me tag along. Can't wait tell March!! !